Celebrity chef, restaurateur, food writer and campaigner Jamie Oliver is the probably the biggest thing to happen to the British culinary scene since Delia. Jamie’s Italian, Oliver’s first high-street restaurant chain, already has 13 branches across the country and more are on the way, so how does a designer bring something original to such a carefully crafted brand? 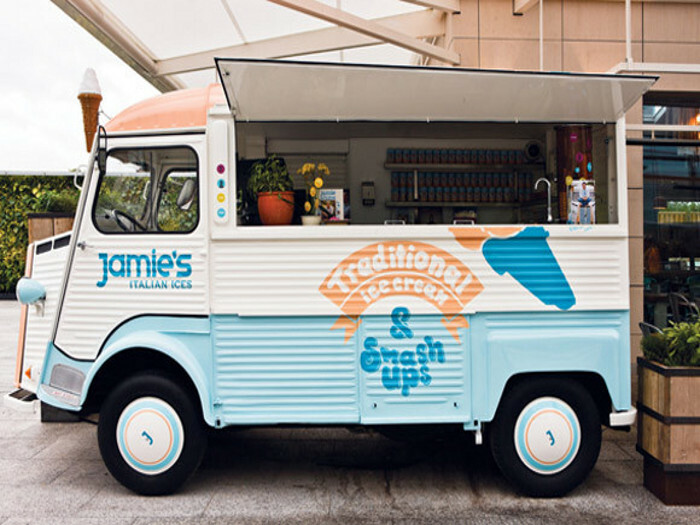 That was the question for design agency Blacksheep when it took on the project to design a branch of Jamie’s Italian at the Westfield shopping centre in west London. ‘As the brand was already well established, it was important to ascertain what was generic and where we could bring fresh creativity and site-specific ideas to the interior design concept,’ says Blacksheep’s managing director Tim Mutton. Blacksheep has plenty of experience in creating talked-about interiors for bars and restaurants, including schemes for The Cuckoo Club, Whisky Mist bar and Inamo, an oriental restaurant with interactive tables, which featured in FX in 2008, but this is the company’s first project for a chain restaurant. 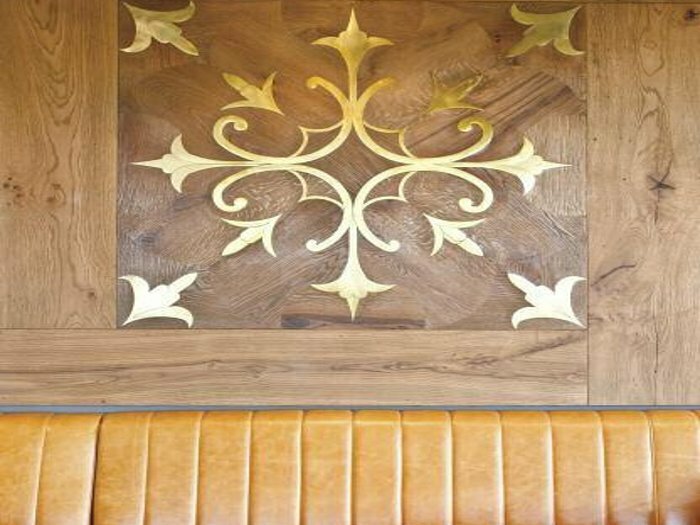 The main restaurant area has custom-made booth seating and freestanding furniture, including Omkstak Stacking Chairs and Tolix chairs. 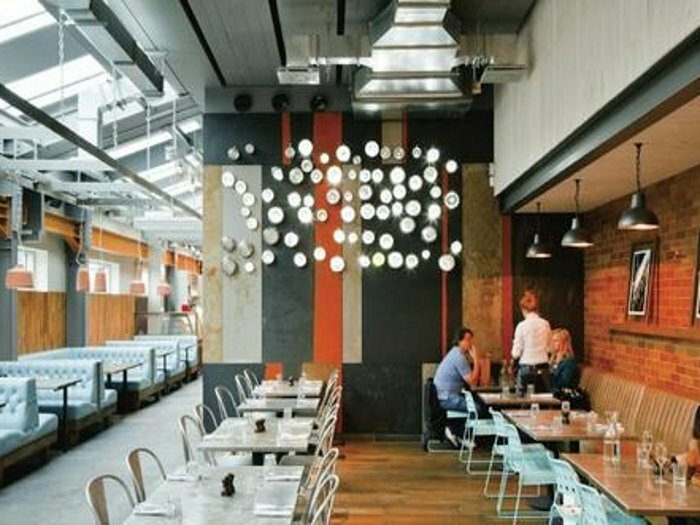 The latter are a signature of the Jamie’s Italian brand, but for the Westfield site Blacksheep specified them in a galvanised steel finish for the outside and blue and black for inside. Flooring is a mix of recycled, engineered timber and Black Mountain riven slate. In his first TV programme, when Oliver was known as the Naked Chef, he was often filmed zipping around London on his Vespa scooter, and this inspired Blacksheep to create a ‘Vespa wall’ decorated with working scooter headlights, which pulsate gently and can be seen from outside the restaurant. Other feature walls sectioning off the toilets are clad with rusted and non-rusted metal panels, inspired by ageing and abandoned agricultural equipment spotted by the Blacksheep designers in fields of Tuscany. During the day, the space has plenty of natural light and the lighting design has been carefully considered to ensure it is just as well lit after dark. One of the mechanisms for this is a metal gantry in the main restaurant area which is used for hanging air-dried Italian hams and also supports balanced-arm PJ50 lamps by Swedish company Örsjö Belysning and hanging workers lights – bare bulbs with gold cage surrounds. 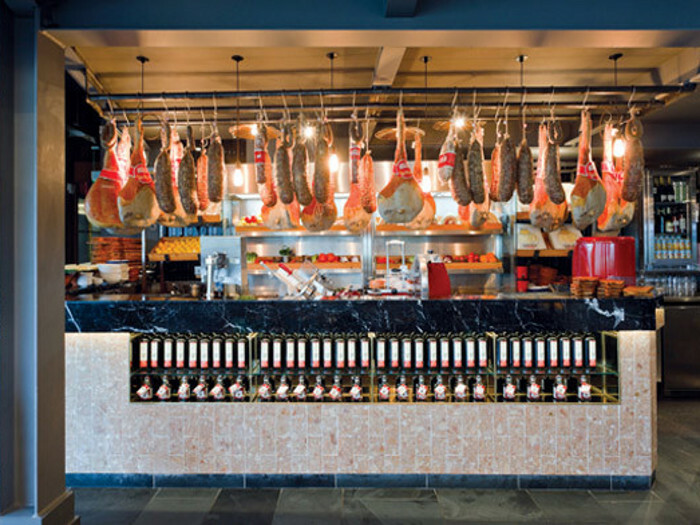 Jamie really loves Italian glass chandeliers, says Leib, ‘and so we also did a “meaty” take on this in the main space, with two bespoke chandeliers each with three different types of glass hanging from butcher’s hooks on a butcher’s rail’. 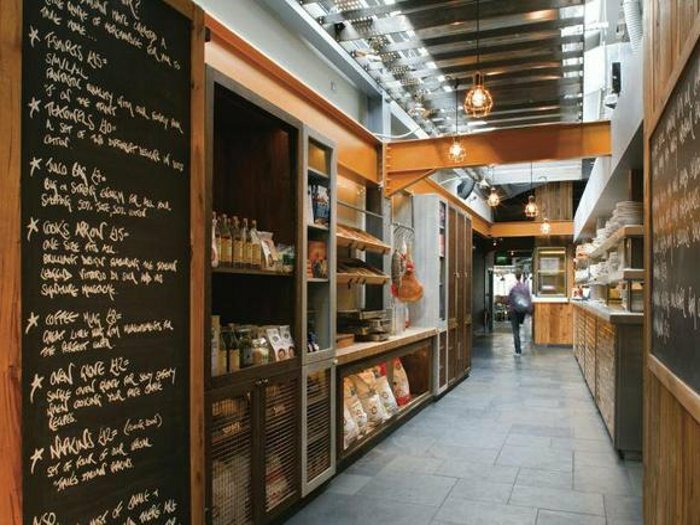 To the rear of the main dining area is the Market Place, where customers can buy various products from antipasti to Jamie Oliver cookbooks. Here the walls have been clad with earthy-brown brick slips reclaimed from a former asylum. To mach these, pendant lights have been created with kiln-fired textured terracotta shades with white porcelain interiors from Viaduct. Oliver is clearly pleased with Blacksheep’s interpretation of the brand, calling the Westfield restaurant, ‘probably our most stunning site to date’ and praising ‘unique design features’ such as the Vespa walls. ‘Jamie’s Italian Westfield is really tuning heads!’ says Oliver.